← Picture of the Week – Fullsteam! Outsiders Art & Collectibles invites you to an exhibit of fine art prints by the iconic, internationally recognized outsider artist, Mingering Mike, and to meet the artist at a reception on Thursday, August 26th from 5 – 9 pm. This event is free and open to the public and will include live music from The Wigg Report and Mel Melton and the Wicked Mojos, and food by Parker & Otis, the Only Burger Truck, Taqueria Lopez and more. 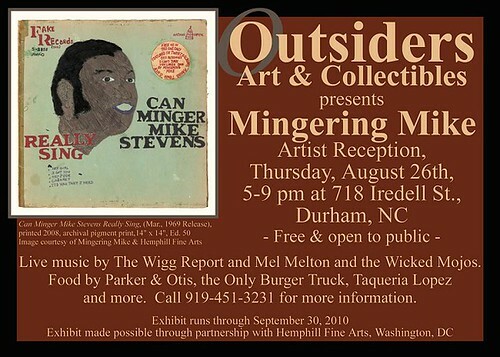 The exhibit will be on display at Outsiders Art & Collectibles through the end of September 2010. Visit www.mingeringmike.com to learn more about this fascinating artist.